"This is smelly no matter how it's viewed." Veteran radio broadcaster Alan Jones unleashed a scathing rant against Adani's proposed $21 billion Carmichael mine on Monday night, criticising the connections the Indian group has in Australian politics through foreign donations. 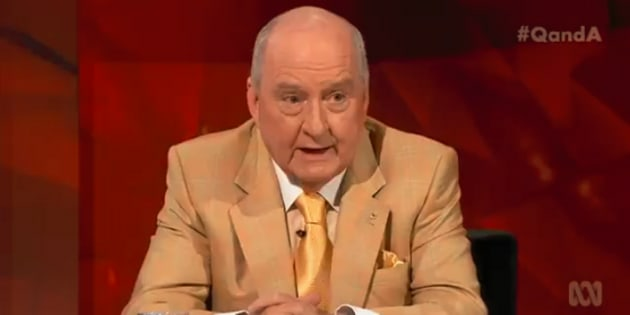 Appearing on the ABC's 'Q&A', Jones attacked the multinational company, saying he doesn't "understand how we would regard these people as proper people to have the kind of involvement in Australia that they now seek." "There's something very smelly about this that the Federal Liberal Government, the Federal Labor Opposition, the Queensland Labor Government and the Queensland Liberal Opposition all have got their hands up saying they're going to support this entity," he said. "Here are these companies tipping in money to the major political parties... There has to be something on here. There's got to be people knocking on people's doors with money saying, 'please vote for us. Please support all of this'. They're throwing any amount of money at getting approval. "I'm not so stupid as not to understand the money is being tipped into major political parties with a view to getting an end result they seek, including a billion dollars of taxpayers' money to build a railway line. Why? When they get the railway line they believe further mine approvals will be given and make a fortune out of the coal traffic along the railway line. This is smelly no matter how it's viewed." The Adani Group's proposed Carmichael megamine will be Australia's largest ever coal mine. The plans for the site are expected to include six open cut pits, numerous underground mines and coal to be transported 200 kilometres to a terminal at Abbott Point, adjacent to the Great Barrier Reef. While a 'Four Corners' report earlier in October raised further doubt about the activities and legitimacy of the Adani family in India as an environmental management entity, in May the Climate Council also labelled the mine a potential disaster for the Great Barrier Reef, people's health, and for the warming climate, while creating a net loss of jobs overall due to opportunities foregone in the renewables sector. On Monday night, former Prime Minister Kevin Rudd also took aim at the proposed mine with a focus on climate change, warning Australians to "be very sceptical indeed". "Whatever we think about what was achieved at the Paris conference, if that is implemented fully, fingers crossed -- then that's one-third of what is necessary in terms of greenhouse gas reductions in order to keep temperature increases within two degrees centigrade this century," he said. "So therefore, the prism I take on this thing is for God's sake when it comes to future coal mines, be very sceptical indeed. And the big danger we see globally, and let's step back a bit not just from fortress Australia -- is that Indian companies, Chinese companies and Korean companies, South Korean companies represent 70 percent of the global investment in new coal mines across the world. "Often dirtier, much dirtier than the ones we're talking about up here. My reservations are about coal period." The former Labor Party leader also then went on to join Jones in criticising the Northern Australian Infrastructure Facility's (NAIF) $1 billion funding of a proposed 388km-long Adani rail line that would connect the Galilee Basin to the Abbott Point coal terminal. "A billion dollars from this [NAIF] is wrong, wrong, wrong," Rudd said. "If this thing was to stack up environmentally or commercially -- commercially it seems not to --, then there is no place whatsoever for the Federal Government to be throwing a billion dollars of public funds by way of a possible loan. "And then at the same time saying that any government subsidy in the future for renewable energies is simply unsustainable. That's rank hypocrisy on the core question for the future, which is climate." The proposed Carmichael mine has been a politically unpopular idea for months, with some saying taxpayer money shouldn't be spent on the construction of the rail link and others organising dozens of national day of action events to voice concerns over the economic and environmental impacts the mine could have. The Adani Group plans to use the mine to import 60 million tonnes of coal from Australia annually and Queensland premier Annastacia Palaszczuk has consistently pushed the message that the project will bring 10,000 jobs to the region. Despite this, Queensland's land court has been told the economic modelling provided as part of the environmental impact statement "overstated" the number of likely jobs and Adani's own consultants put the figure at just 1,464 jobs.